← New blog, first post! Mountains wall hanging. There so many variations on this pattern, it’s hard to choose just one, but so I thought I would highlight one of most common layouts you see — plus I really like the looks of this one! Here is one quick way to accomplish the quilt you see on the left. Can you isolate the block? I purposely used a dark background fabric so the block lines would not be very obvious. The “secret” for this quilt is not so much the block, but the layout that was used. Create this block in EasyDraw. Begin with a new EasyDraw block with the block size at 8.00″ x 8.00″, snaps a t 32 x 32 and graph paper divisions at 8 x 8. 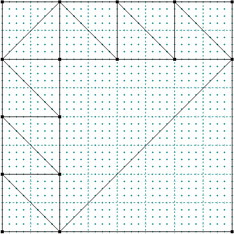 The small half-square triangles on the left and top are two inches. It’s not a hard block to draw! Color your block and add it to the Sketchbook. 2. Switch to the Quilt Worktable. Go to QUILT>New Quilt>On Point. 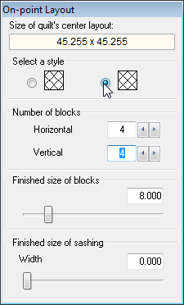 On the Layout tab select the on point style on the right, change number of blocks to 4 x 4 and the block size to 8.00″. 3. Switch back to Layer 1 and begin by setting your new block in the four spaces in the center of the quilt. Switch to the Rotate tool and rotate them so all the sawtooth edges are facing outward. 4. Working out from the center and in “rounds” add the remaining blocks and rotate them as before. That’s it! Try other similar blocks for a different look. Add or subtract rounds for different size quilts. 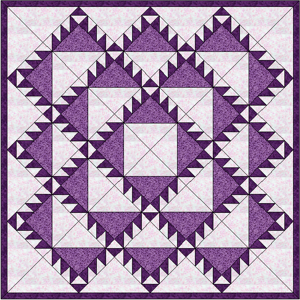 For example, you might only want two rounds for a wall hanging size quilt (use a 3 x 3 block set of this same on point layout). 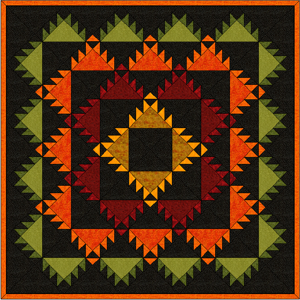 This entry was posted in Quilting and tagged Delectable Mountains, Electric Quilt, EQ. Bookmark the permalink.